The Consumer Technology Association (CTA) has been actively developing a new streaming standard called CMAF (Common Media Application Format). With 60 participants and 3 years of effort, the group is nearly done with final specifications expected in early 2019. What it promises to do is to streamline how content is encoded and delivered and improve the end-user experience by helping ensure this content plays correctly on more devices. This effort addressed major issues in the streaming media ecosystem: complexity, compatibility and cost. For example, content distributors have to create client player apps supporting multiple versions of the same content for different types of devices. Each app must account for variations in streaming modes, frame rates, display resolution, DRM requirements and more. And, all these iterations have to be supported with multiple encodes and packaging for each video program. Each app must be tested with elaborate procedures designed to ensure each player works as intended with each type of device. On the device side, OEMs have to make sure their products can support content their customers want to access. This is complicated by a wide range of processing power in playback devices. With wide variations in how service providers compress, package, encrypt and transmit their content, manufacturers of such devices have to choose which codecs, DRMs, streaming formats and browsers they want to support and then test against all possible combinations to ensure optimal performance with any piece of content that’s mapped to one of those combinations. This need for playback consistency runs across multiple types of platforms from PCs to phones to TVs and streaming devices. You get the picture – its messy out there. CMAF is a container format based upon fragmented MPEG (fMPEG), a format the Apple and Microsoft cooperated on to create. 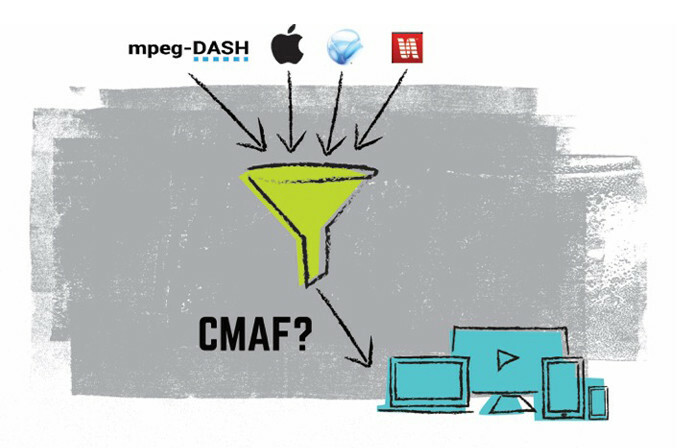 This made it possible to build an ecosystem around the use of CMAF as the container for streaming with Apple’s HTTP Live Services (HLS) as well as MPEG-Dynamic Adaptive Streaming over HTTP (DASH), which have become the dominant streaming modes worldwide. CTA took the initiative to expand this foundation with a working group called Web Application Video Ecosystem, or WAVE. Some the key specs and test procedures have now been finalized. As a result, content distributors will be able to encode and package content with greater certainty that their assets will be rendered as expected across a vast population of WAVE-compliant devices and consumers will be able to purchase devices with greater confidence that they’ll be able to access the content they want. WAVE also specifies validation and test procedures so content orginators and playback device makers can self-certify compliance. All this is designed to provide the best possible experience based on the particular capabilities of the playback device. Work on these specifications is conducted through the Content Specification, Device Playback Capabilities and HTML5 API Task Forces. At this point the task forces have completed the first set of content specifications and the related test suite as well as the HTML5 Reference Platform with Web APIs and test suite, with expectations that the Device Capabilities Playback Suite and validation test procedures will be finalized in early 2019. What’s cool about this CMAF approach is that it leverages existing technologies without having to invent new ones. And with major players supporting its development, commercial adoption seems pretty certain. For example, AWS Elemental is implementing CMAF support across on-premises and cloud-based video solutions. This means a single file format can be used for live or on-demand streams using either the AVC or HEVC codec along with fMP4 segments. These segments are then delivered as different adaptive streaming technologies using separate manifest files. On the encryption front, major players (Google with Widevine, Microsoft with PlayReady, and Apple with Fairplay) have all moved to support Common Encryption that is interoperable with CMAF. That allows video solutions from AWS Elemental to create a single encrypted file compliant with a variety of concurrent digital rights management (DRM) standards. This eliminates the need for separate content silos to support each type of consumer device. Together, these new capabilities offer substantial benefits to video providers by eliminating the cost and complexity of packaging and storing multiple versions of streaming protocols and DRM files on the origin server. And, by removing the need to generate multiple file formats, CMAF can dramatically reduce encoding costs. CMAF compliant video will also reduce latency and allows multiple closed captioning standards to be used within the container. But it does not solve the most advanced problems yet, say developers. For example, it is currently a challenge for a web media player running in a browser to know how to discover the device capabilities to manage the luminance and colors needed for HDR content. This will require more API development for browsers. Nevertheless, this is a big step in the right direction. As a result, we may want to soon start looking for WAVE-compliant content and devices.